PORTLAND, Ore. (KATU) - A small group of fathers, sons, mothers and daughters rode from Hillsboro to Hollywood on the MAX armed with a bag of rocks to fight hate and spread love. Jose Cassady organized Saturday’s event. 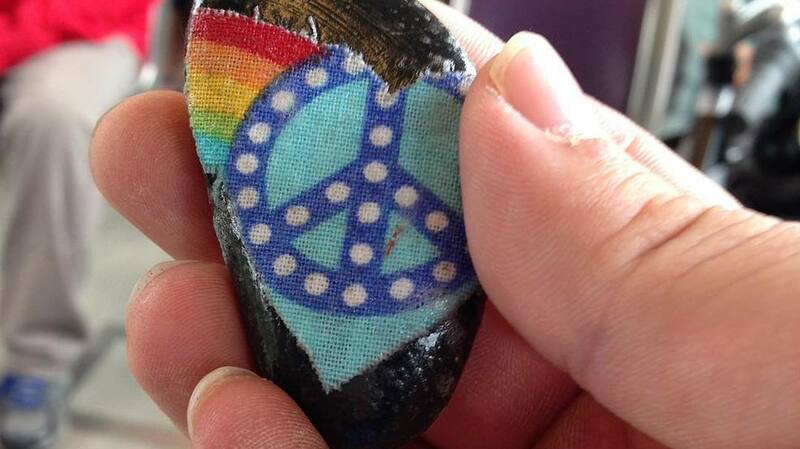 He and several others distributed "Love Rocks" on the train - small rocks with a heart and a message glued onto them. “We're here to spread love and the show the community that in the times that we've had the last couple weeks we can heal the community with love and just spreading love to people,” said Cassady. Cassady is touching on something many Portlanders are feeling right now: fear. In just the past few weeks, the city has seen a deadly MAX stabbing, huge protests downtown, hateful speech, and a suspicious device left on the MAX that brought out Portland Police’s bomb squad. Cassady’s son Jaxton immediately began placing rocks on the seats and windowsills when he boarded the train. He handed one to the MAX operator, who thanked him. “I go on the MAX all the time with my son and we can't be scared. We can't live in fear. There are so many better people out there than hateful people,” said Cassady. John Polk was riding the train when someone gave him a Love Rock. Cassady and his son made about 100 rocks over the past week. Another volunteer made hundreds more. Cassady estimates they had between 200 and 300 rocks to distribute. He brought the rocks onto the train in a backpack that was so heavy his son couldn’t even lift it. "I think it's necessary to spread love every day, and it’s something that we like to do,” said Cassady. They ended the journey at the Hollywood Transit Center where the group placed their Love Rocks around the large, ever-growing memorial for the victims and survivors of May's stabbing.